Over the last decade the business landscape has changed as more companies and users – spanning business and IT – have grown dependent on analytics to drive better decision-making. With so much riding on it, are you treating your Business Intelligence solution like a Tier 1 application? If not, it’s time for you to rethink your strategy and approach to business analytics. Watch Top 3 Global Big Data, AI & Analytics influencer Ronald van Loon and Pyramid Analytics’ Principal Technologist Ian Macdonald for this informative webinar. The rapid growth of data sources are causing businesses to transcend traditional visualization approaches to use data and analytics, Machine Learning, and AI to eventually arrive at a self-service business model. Go beyond enterprise wide-analytics and build a time efficient analytics ecosystem that sidesteps common data preparation challenges for a work-anywhere, deploy-anywhere architecture. - Building data governance frameworks to overcome challenges in data preparation. - AI and Machine Learning usage and the impact of intelligent automation on end-user data preparation. - Single data lake vs. operating system and data management. - Preparing data for business use with steps that enable businesses to Discover, Illustrate, Present, and Publish. - Scale Analytics OS on-premise and in-cloud for hybrid deployment. Pyramid 2018 is the next generation of self-service analytics. As the Analytics OS, Pyramid 2018 allows you to implement your analytics strategy while delivering analytics excellence across your organization. Pyramid allows you to combine SAP Hana data with other data sources to provide better insights for your business. This short demonstration shows how easy it is to setup and directly query SAP Hana with Pyramid. Data leaders face a daunting challenge: implementing enterprise-wide data strategies that deliver tangible wins without sacrificing security, agility, and transparency. To successfully implement their strategies, they must approach this by deploying a solution that leverages existing investments while meeting changing organizational needs. We will discuss best practices for taking their data strategies through the last mile and how an Analytics OS makes it possible. In today’s retail industry, the customer service bar is set higher than ever—the nice-to-haves are now the must-haves, and if you don’t offer them, customers will turn to other retailers who do. From print ads to e-commerce to brick and mortar, customers expect a unified experience across all sales touchpoints, otherwise known as an omnichannel experience. How do you know what the customers want? A data-driven strategy is key to deepening consumer understanding, increasing engagement, and maintaining a seamlessly integrated customer experience. During this 45 minute webinar Ronald will propose a structured journey to achieving these goals, Ian will bring those steps to life through a practical demonstration of Pyramid Analytics’ BI Office in a retail environment and Martin will provide perspectives from his experience as Technology Director at Liberty Ltd and Head of Strategy and Architecture with Harrods. Start modeling with the Pyramid 2018 platform. This video covers the capabilities with Advanced Data Model. Use a variety of building blocks to customize the ETL process. Self-service analytics solutions often quickly expose data quality issues that you may not even realize exist. Unfortunately, inaccurate data undermines the value of analytics. If people don't trust your reports, they won’t use them. Since self-service analytics credibility, adoption and success hinges on accurate data, data quality should be given more attention as you implement these solutions. Please join me in this informative session to learn how to address common data quality issues. We will cover practical recommendations, review top data quality solutions, and share additional lessons learned. In this session we will explore how to apply proactive, predictive intelligence to enhance reporting. Pyramid Analytics provides a complete platform for analytics visualization with sophisticated, point-and-click algorithms, made simple – empowering everyone to discover hidden insights. Please join me to learn how time intelligence, statistics, forecasting, clustering, R integration, and even creative use of parameters and variables can be used to identify patterns and relationships in data that weren’t initially evident. Enjoy the power of advanced analytics to improve organizational performance and outcomes. No statistics degree required. The healthcare industry is transitioning to adjust to a more digitally reliant world. As healthcare organisations convert from a fee-for-service industry to a value-based payment model, they need to have modern technologies to support all aspects of clinical and financial operations. Healthcare administrators need the right technological tools to improve operations, address patient care more effectively, and solve industry challenges. A modern BI&A platform can offer advanced analytics solutions for the healthcare industry in a variety of applications, providing whole-system analytics to bring together clinical, operational, and financial data. •Trends and challenges within the healthcare industry. •Relevant use cases for BI&A platforms within a modern healthcare environment. ---Effectively addressing patient satisfaction levels and experiences. ---Population health and care management for best possible outcomes. ---Measuring quality scores and outcomes for healthcare best practice compliance. ---Provider performance analysis across care continuum. ---Improving labour utilization and evaluation. ---Focusing on patient and clinical care from an operational position. •Increasing the value of healthcare data via a modern BI&A platform. Please join presenters Ronald van Loon and Angelika Klidas at the conclusion of the webinar for an interactive Q&A. Organizations across the business spectrum are awakening to the transformative power of data and analytics. To truly become a data-driven organization and increase analytics adoption, explore embedding analytics into apps and business processes your users already love. It is easier to bring analytics to the user than to change a user. In this session we will share “how to” embed Pyramid Analytics intelligence into your apps, lessons learned, and best practices to deliver insights when and where decisions are made. Daten gelten als Öl des 21. Jahrhunderts und Produktionsfaktor. Immer mehr Daten werden gesammelt, um fundierter entscheiden zu können und das Unternehmen dadurch erfolgreicher zu steuern. Dabei sind Unternehmen i.d.R. doppelt herausgefordert: einerseits durch die ständig wachsende Menge an Daten, andererseits durch die Notwendigkeit, sämtlichen Mitarbeitern immer umfassenderen Zugriff auf Daten zu geben. Es kann daher durchaus schwierig erscheinen, die riesigen Datenmengen und -nutzung erfolgreich zu managen. Eine Corporate Self-Service Analytics (SSA)-Umgebung ist daher ein wesentlicher Bestandteil zur Stärkung einer datengestützten Strategie. In einer abschließenden Q&A-Runde haben Sie dann noch die Möglichkeit, mit unseren beiden Experten Fragen bzw. Themen zu diskutieren. Howard Dresner, noted business intelligence analyst, and Peter Sprague, VP of Product Management, discuss Howard’s latest research around collaborative BI, what collaborative BI really means, and how organizations are using collaborative business intelligence to increase adoption, reduce content development times, and get more value for their organizations than ever. Outcome driven healthcare organizations today are embracing analytics and self-service BI reporting programs. Where do you stand in comparison to your peers? How far have they progressed in the analytics maturity model? What are their common challenges, gaps, and successes? What other technologies are they exploring? Please join me to review our recent research and openly discuss our findings. In this session, we will cover how to design a governed, enterprise self-service reporting strategy. Topics include solution selection requirements, organizational structure, architecture, implementation checklist and best practices for responsibly implementing self-service BI across an enterprise. We look at ways to fill gaps and augment existing Microsoft BI or Power BI environments. 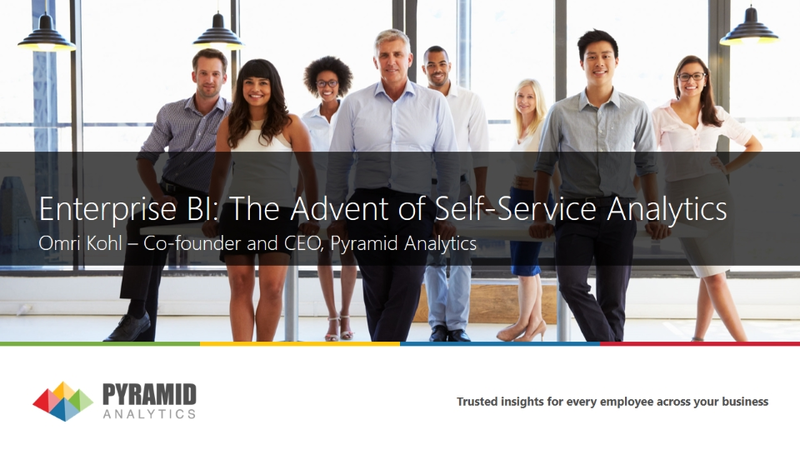 We'll also share organizational models for delivering self-service BI with agility yet maintaining strong governance with Pyramid Analytics best-in-class capabilities. Traditional business reporting is often one-size-fits-all. It rarely provides the targeted analytic content required by different decision-makers with unique informational needs. Business leaders need more than just accurate and timely reporting—they need data-driven analytic context. In this webinar, we’ll examine how organizations can benefit from modern BI tools that feature advanced, customizable reporting capabilities (smart infographics, dynamic text, and more) that automatically deliver contextualized analytic content for specific users. Examples will be demonstrated using Pyramid Analytics’ BI Office. True governance covers numerous aspects of the business intelligence environment – not just who has access to what data but how reports, dashboards, and other content is managed. This webinar will discuss challenges organizations commonly run into and how successful governance programs must not only correctly identify all of these aspects, but understand how they all fit together. Modern self-service personal productivity analytic tools allow individual users to create sophisticated calculations and sets. However, for an organization to maximize the value of analytics this business logic must be released from myriad of spreadsheets and documents that it is embedded. Join us to discuss how analytic platforms allow data-driven organizations to centralize, share and contextualize this content. Thought-leadership topics relevant to BI professionals and decision-makers from leading industry and product experts.